Farid N. Najm received the B.E. degree (with distinction) in Electrical Engineering from the American University of Beirut (AUB) in 1983, and the M.S. and Ph.D. degrees in Electrical and Computer Engineering from the University of Illinois at Urbana-Champaign (UIUC) in 1986 and 1989, respectively. He worked with Texas Instruments in Dallas, Texas, 1989-1992, then joined the ECE Department at UIUC as an Assistant Professor, becoming Associate Professor in 1997. In 1999, he joined the ECE Department at the University of Toronto, where he is now Professor and Chair. 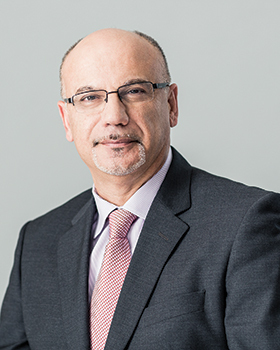 Dr. Najm’s research interests are in the general area of computer-aided design (CAD) for integrated circuits, with an emphasis on circuit level issues related to power dissipation, timing, and reliability. Dr. Najm is a Fellow of the Canadian Academy of Engineering (CAE) and a Fellow of the IEEE. Fellow of the Canadian Academy of Engineering (CAE), since 2010. Distinguished Alumnus Award, Faculty of Engineering and Architecture, American University of Beirut (AUB), 2007. Inventor Recognition Award, Semiconductor Research Corporation (SRC), 2003 and 2005. Fellow of the Institute of Electrical and Electronics Engineers (IEEE), since 2003.